New Nova Starband antenna above now obsolete better 360 antenna. Canceled service - moved to "Basic DSL". Although the DSL download speed is 600 k bits/sec compared to the Starbnad "1500 service" speed that peaks at 2,400 k bits/sec and sustains 1,500 bits/sec the DSL ping time of 100 ms is much faster than the Starband (or any satellite based service) ping time of 800+ ms.
at&t finally got the DSL to work. The problem seems to have been a truck connection between the DSL box and the crossover box at the foot of my street. 608 k bits/sec is about half the speed of the Starband 1500 service. at&t is $15/month, Starband 1500 is $100/month. at7t ping time is about 100 ms compared to Starband 800+ ms. Web pages load noticably faster. Swapped the dish, arm and feed horns of the old (bottom unit in photo above) and new (on roof in photo above). Prior to the swap the Rx signal was 6.9 and after the swap it was 8.9! This was done by removing the arms from both dishes and swapping the Tx and Rx units (leaving the feed on the arms then removing the dishs from the mounts and swapping them. 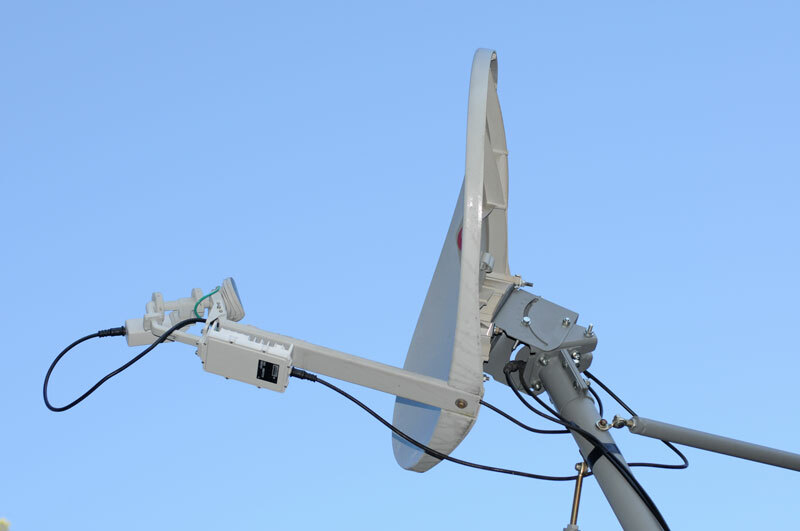 The Nova dish has a longer arm (31.5") than the older better 360 dish arm (19.5"). By using a green laser pointer aligned with the support arm I could see that there were tree tops in the beam (assuming that the beam points along the line of the support arm, anyway that's what Starband told me. After using the laser pointer to identify the tree that was the most in the beam and cutting it down, the next day the laser pointer showed another tree also in the beam. On 18 June there are not trees in the beam, but are just below it. The Rx signal EbN0 is in the sixes. It's hard to tell if this was the cold problem until next winter. 48.7 deg F outside and s/n 5.51 i.e. system on the ragged edge of working. I received an email from Eric who told me of the problem of warped dishes (he has the reinforced plastic dish like mine, not a metal FTA type dish). As the temperature gets colder they can distort lowering the signal strength. Now to come up with a way to test for this. This makes more sense since it's hard cold would effect other problems like water, i.e. water is a disaster when liquid and the temperature may not be cold enough to freeze it. This has been the wettest winter in about a decade and StarBand does not work in the rain (either at the base station in Georgia, or my location in N. California). So ofter, like right now, I'm using a dial up modem to connect to the internet. Still have not taken apart the microwave parts to clean, dry and reassemble them using Silicon grease to make sure all the joints are water vapor tight. That needs to be done when it's dry outside. The input is at the upper left, followed by three stages of amplification that includes some band pass filtering. The white disk in the lower left is the dielectric for the local oscillator which is tuned by the metal screw in the lid. After the three stages of amplification there's a band pass filter and following the LO there's also a filter. The IF output is fed to the type F connector on the right which is also the 24 VDC input. There's no heater. http://www.broadband.gov FCC broadband internet access on line test. * this is the problem that really slows things down and makes VOIP impossible. Most of this morning with a clear sky, it was near freezing outside and the Rx signal EbN0 was about 3.47 around noon, i.e. no internet connection. So, swapped the LNB from the old (wall) system and the active (roof) system. The system works after the LNB swap. It looks like a heater would greatly improve the signal strength. Starband does not know about a heater or radome, but suggested that there may be some small item trapped in the waveguide plumbing. As the outside temperature gets colder the LNB seems to be degrading. Note the pointing is good (i.e. signal is 8.32 at 11 am). Frost on roof and ice in gutters. System off since 3 am. Back on at 8:30 am not shure why. Drying feed with towel did not fix it. Heating with hair dryer did not fix it. Strange. After an hour or so the signal came up and the system started to work again. Repointed to new sat. But problems with browser not showing all of page. Fixed early March by Starband changing a setting. Sky Manage /Status shows HTTP Acceleration as OFF. 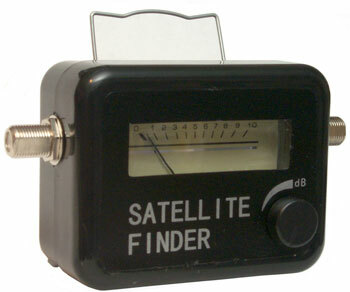 Sat Finder - device to aid in pointing dish. 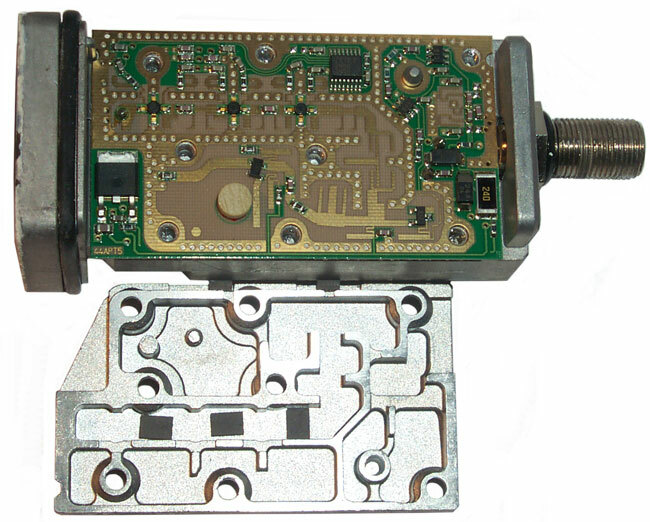 Designed for 13 - 18 VDC using a 10 volt Zener diode and pass SOT-23 transistor, but should work OK with the 24 VDC Starband Ku band receiver. I've received two letters via USPS about getting my antenna repointed to a different satellite before 1 Feb 2010, but so far have not been scheduled. A license has expired on the Proxy, and your request is not permitted: "The SGOS license has expired"
A new license must be obtained. Cycling power on the Sky Edge modem fixes the problem. 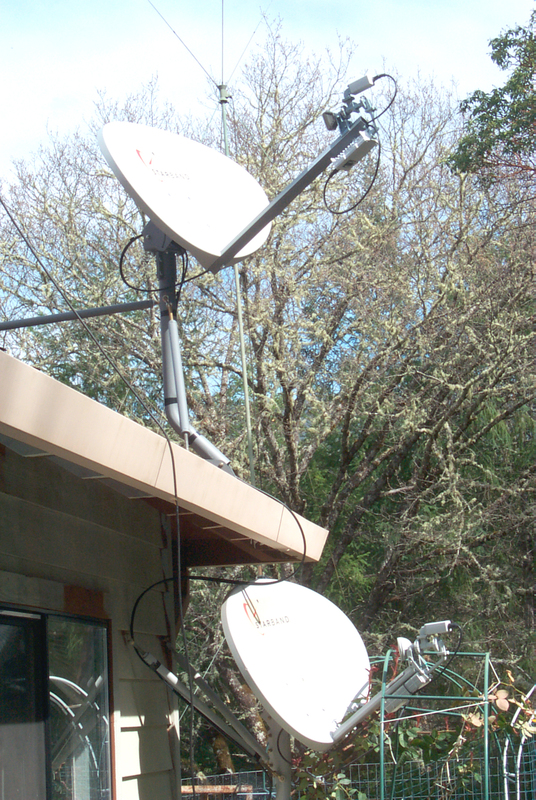 There are faster satellite services offered by the parent company of Starband, called Spacenet. There are two broad classes: a dedicated channel all to yourself called thier "Performance" series, very expensive. The "Broadband" series is a shared channel and is considerable lower in cost, but still many time more expensive than the top of the line Starband 1500 service. They claim download speeds in the 1024 or 2048 k BYTES/sec range. The Starband 1500 service is 150 k BYTES/sec (i.e. 1500 bits/sec). Red Xs on Page below. This error seems to be caused by a memory leak in the Nova operating system. The fix is to power down (unplug the power supply from the box) for about 10 seconds then reboot. Note this can be done without doing anything to the PC, unlike the 360 that required software istalled on the PC. So after the Nova reboots you can just refresh the browser windows showing the Network Error (dns_server_failure) and they will then load properly. The error message when trying to get to a web page is something like "Server is Refusing Connection". In this case the "server" is the Starband modem since it has been set as the proxy. See the 14 March 2008 info on how that was done. This seems a confirmation that the Nova box has a memory leak since unplugging it for 10 seconds fixes the problem. 3 Apr 2008 - In addition to the Network settings below you need to add exceptions to access the router and to access SkyManage so their address' as 4 octal digits need to be added. check the third box down "Use a proxy server for your LAN (These settings will not apply to dial-up or VPN connections). OK all the way out and close Windows. Reopen Windows and check to see that the above settings are still there. The signal gets weaker for more than 10 minutes either side of the most severe outage. Photo taken during 7 Mar 2008 solar outage. the old antenna was seeing a lot of the metal rain gutter. The upper antenna is totally in the clear. Cloudy so ceiling sun dial not working. Tried and failed to send email. Then noticed the time was 12:51 and checking the signal strength showed none. Within a couple of minutes it was back. I has hoping that the Nova antenna now on top of the roof (see photo above) would work much better than the old antenna that was aimed at the metal rain gutter, but for Solar outages they are about the same. Taking a photo of the two dishes would be interesting is done at the center of an outage. The suns shadow on a dish would mean a lot of signal blockage, but no shadow would not mean a clear view because of the offset type feed. My celing sundial mark for the 360 system is showing an outage now and the Nova has no signal. Based on the outage area 12:50 am is about the center of today's outage. For a number of years Starband has not been taking new orders for the older 180, 360 and 400 series modems. The new modem called the Nova has replaced them. The Nova can run at different speeds controlled by what firmware is loaded. The "Pro" entry level service I started with provides a download speed that's controlled to be about 500 k bits/sec or 50 kBytes/sec. The upgrade speeds are 100 kBytes/sec and 150 kBytes/sec. Along with the faster download speed comes faster upload speeds and a higher bandwidth allocation. My "Pro" allocation was 1 GByte/7 days and that's now 4 GB/7 days. The one thing that does not improve is the ping time which is limited by physics and the speed of light. So altough web page load times are noticably faster they still are not whay you see on a DSL, or Cable Modem connection. When viewing a web page, like an eBay auction page, I was seeing a number of red X marks where an image should be, like in the photos section. I think this is caused by a bug in the Nova software that's related to memory allocation. The fix is to power down the Nova for 15 seconds, you can leave your computer and browser windows open, and then let it reboot. This zeros the RAM in the Nova and for me fixed the problem. 28 Oct 2007 - need to see when this is needed again. 30 Oct 2007 - an eBay acution with 12 photos showed 8 X instead. Pressing the browser refresh button did not help. After power cycling the Nova and prseeing refresh all photos were visible. In order to share the service I've added a Linksys WRT350N Router and a WUSB300N which is a USB device for the upstairs computer. The router includes a 4 port hub so you can use CAT5 (or better CAT6) to wire up local computers. The installation software that comes with the router handles all of the configuration. It's very close to plug and play. The cable between the Starband Nova and your computer is a crossover cable (that way you don't need a hub when connecting the Nova directly to a computer). So the crossover cable needs to always be connected to the Nova and when a router is used the crossover cable goes between the Nova and router. Then a standard CAT6 cable connects the router and your computer. power off the PC, router and modem. (PS. CAT6 cables are not designed for hot plugging so it's best to power down equipment before changing them). If you have just a Nova connected to your PC you can reset the Nova by just powering it off (leave the computer on and leave your browser open), wait 15 seconds then power the Nova back on. If there's a software update this will allow force it to load, but more important it cleans up the memory and DNS routing table in the Nova. They have fixed the usage graph. 8 June 2007 - Still not available - I guess that's a good sign that they know it's broken and it's getting fixed. My usage is way below 139 MB/day and on average way below their 7 day limit, so it was wrong to "throttle" me based on the wrong usage count. 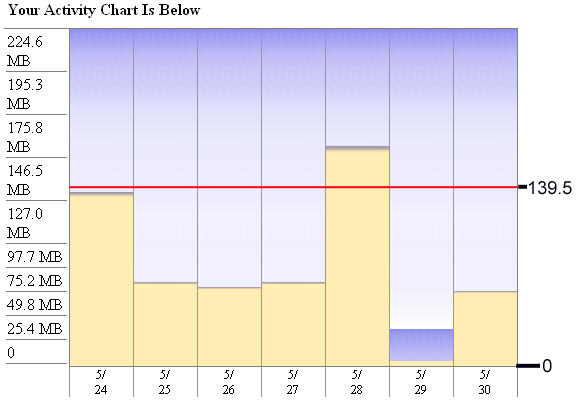 View Bandwidth Usage The graph is temporarily unavailable. The graph will return 7/1/2007. The graph is temporarily unavailable. The graph will return 7/1/2007. 5 June 2007 4:52 - maybe they have fixed the counter. The data for yesterday is within a few MB of my count. But for today 6/5 the Starband count is around 100 MB and my count is 73 MB so there's still something no correct, but it's way better than before. 2 Jun 2007 8:48 pm - Starband only showing 6/2 on the graph, but still with no usage, so it's looking like the plots are based on Eastern Time midnight. Although the first page shows -41.4 MB, yet DU Meter is showing 48 MB for today and 126 MB total download since it was installed on 31 May at 9:14 am. So there is a big bug in how they are counting usage. At 9:07 Pacific Time the plot now shows 6/3 confirming midnight Eastern Time for the new day. 1 June 2007 9:30 pm - Starband is showing data for 2 June, so they probably are using midnight Eastern Time for their count. My DU Meter is showing 54 MB downloaded today Pacific Time. But Starband is not showing MB value for 1 June. Maybe they turned it off while working the problem? 1 June 2007 - For the partial day 31 May DU Meter shows 22.85 MB and Starband shows almost zero this morning. But yesterday afternoon it was showing 195 MB. I was on the phone to them yesterday for a long time, so maybe they zeroed it? Current Usage Your current 7 day usage is 1.0 GB and the maximum threshold is 976.6 MB. Activity for last 7 days Click here to view your real-time bandwidth activity for the last 7 days. 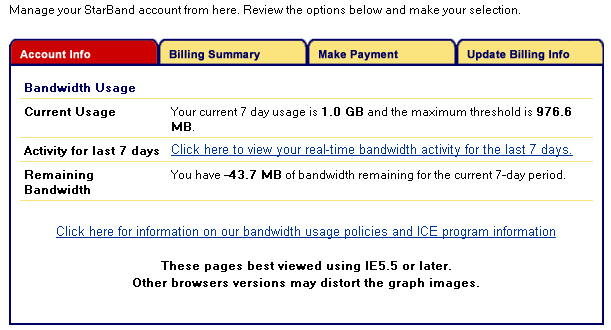 Remaining Bandwidth You have -53.4 MB of bandwidth remaining for the current 7-day period. and the daily detail page is showing about 195 MB for today! Between the download and 2:28 the rate of use according to DU Meter is 0.03375 MB/min or in 9 hours for today would total 18 MB. I'm now thinking that the data being reported is Mega bits/second, not Mega Btyes/second. With one start bit, 8 data bits and one stop bit the translation from bits to Bytes is 10 so 195 Mega bits turns into 19.5 Mega Bytes which is about right. 31 May 2007 - Have downloaded DU Meter and have it run+ning. The idea is to compare my download volume to the Starband reports. Note: Bandwidth is a technical term that related to data rate, not the amount of data. So the Starband (and common internet) usage is technically wrong. My account has a bandwidth limit of 50 kBytes/sec and a 7 day usage total of 976.6 M Bytes. 976.6 MB / 0.05 MB/sec = 19,532 seconds or just under 5.5 hours. A download that lasted for 5.5 hours all at 50 kBytes/sec would us up the total usage for a week. Or 46.5 minutes per day. 31 May 2007 - Jason (#7107) recommended a bandwidth meter to run on my computer. A firewall or router is not the tool that will do this. 136.0 + 81.5 + 81.2 + 86.1 + 224.8 + 0 + 86.5 = 696.1 still well under the limit. Notice that they are reporting numbers to 0.1 MB yet claiming that the numbers are not accurate. If the problem is in the reporting of the numbers, i.e. the web page that's displaying the numbers to me shown below is wrong by 71% (my numbers below) or off by 43% (the numbers I got today) then there needs to be a way for me to audit what's going on. The suggestions were to look at the incoming data in a firewall or router. I'll learn how to do that. They also said that I was not in the penalty box, but that was hedged, i.e. no one really knows. The penalty box may work by restricting the number of open TCP/IP connections you can make. 30 May 2007 - NOT OVER LIMIT -- Starband can not add! An hour or so ago I started getting a lot of "Page Not Found" errors, and this morning and for the last few days I have only seen a very small number of them, so I took a look at my activity page. Here is the message saying I'm over the limit, it's located at the bottom of the "My Account" page you get right after you log in. This page is for Nova users. Don't know about 360 users. The following screen shots were captured in IE6.0.2900 on 30 May 2007. At first it looks like I went over the limit and they have started to "Throttle" my access, hence the "Page Not Found" errors. But today I've been paying attention to what I do and no way have I been using a lot of bandwidth. My service has a limit of 976.6 MB which divided by 7 days is just under 140 MB per day. So lets have a look at the daily data by clicking the activity link. I've added a line for the average daily limit in red. The way I figure it the total area needs to be below the red line. What do you think, am I over the limit or maybe Starband can not add. If I add up what's shown I get 135 + 70 + 70 + 70 + 170 + 2 + 65 = 582 leaving a positive balance of more than 390 MB. Another way to say it is that the activity is about 40% of what's allowed. 30 May 2007 - I've over run the 976 MB limit again. Not watching video, but just srufing the USPTO and Google patents web pages where the old patents are images, not text. Since 976/7 = 139 MB/day that's the rate of make up if I don't use the computer for a day. The "Page can not be displayed" errors are now pretty much gone, maybe one per week. So they must have it fixed. 14 May 2007 - This is an email I sent a friend asking about my net connection. http://www.prc68.com/I/Sundial.shtml#SSB At the next equinox we'll see how this system works. The new system uses the same 2x3' offset feed dish and some of the microwave parts as the old system so i'm keeping it for spares. The big improvement is the indoor box. The old 360 system required software on the PC to work and was a PITA. The new system has it's own PC and you just run a LAN cable to your PC or router. The good news is that big file downloads go at about 50 k Bytes/sec (500 kb/s). And if you don't exceed the 976 MB/rolling 7 day limit you're OK. Going over the limit is very very painful. The bad news is that because of physics it takes 23,000 miles/186,000 mi/s of a second for a signal to get from your transmitter up to the satellite, then another 1/8 second to get from the satellite to the big dish in Georgia. From there everything is fast, but then it takes another 1/8 second for the reply to get from Georgia to the satellite and another 1/8 second to get from the satellite to your receiver. That's a minimum of 1/2 half second for each transaction. Every icon or link that requires your browser to do something is a transaction. So loading a page, like eBay or commercial pages with a lot of fancy imagery can take up to a couple of minutes. The base service is not suitable for VOIP. I can set a URL in my browser to the IP address of the indoor box and the SkyManage web page has information about the Nova system. There's a page for telephony. I've been told that if I upgrade to the $100/mo system I get 100 kB/sec download speed and can then use VOIP. But that's too expensive for phone service. The upload speed is about 3kB/s. I haven't tested it on the Nova, but if you think about the dish size and Tx power it can't be very fast. It's a classical Vsat system like you see on the roof of most gas stations. I was complaining to eBay about the bugs they introduced with the new feedback system this morning using the live help where you get to talk to a computer, and during the 20 minute session there were maybe 3 or 4 "connecting to the server" messages. That may have been Starband dropping the connection because of a software bug. It's not uncommon to try and go to a page and get a "Page can not be displayed" error. Upon trying again it often connects. 1) Reboot the Nova by unplugging (there's no on-off switch) the brick power supply cord from the indoor box for 15 seconds. This resets the CPU in the Nova box and if they have downloaded any firmware will install that. This is where the Nova has it all over the old 360 where you needed to shut down and reboot your computer. You can leave browser windows open while you reboot the Nova box and continue where you left off after the reboot. (maybe a few minutes). 2) Reboot your PC. This has helped when the system refused to work. Since I can't get DSL or cable modem here in the forest and dual channel ISDN is expensive, this is the best I can do. When it's working it's better than dial up, but when it's not you suffer. 10 May 2007 - The system got really slow a few days ago. To the point I was considering moving into motel or renting time on a computer to get decent access. I complained to the installer of my system and he mentioned that there was a bandwidth limit and if I went over the limit I would be throttled. That word has it's origins in beating someone, and that's just how I felt. A call to Starband confirmed that in fact I was being throttled. The limit is 976 MB per 7 days and I was at 2000 MB. So now I know to look at the bottom of the My Account web page to get a clue. But so far that page has not changed even though I've backed way off on the rate of web page updates. I think the upper limit is 2000 MB because it has not changed for 3 days and my usage is way down. 10 Apr 2007 - It seems that removing the power plug for 15 seconds can be done leaving open browser windows. After the modem reboots you can continue where you left off. No need to change anything on PC since the Nova works by itself. Still having a lot of "Page Cannot be Displayed" errors. My first Starband system used the Gilat 180 modem which I think was the same modem used in their commercial VSAT operations. Later there was an upgrade where I traded in my 180 box for the 360 box. The 180 box was a stand alone system but the 360 requires some software on your PC to work well. A couple of months ago I got the new Nova Pro Starband system (not upgrade so I still have the old system, a couple of the antenna parts are the same so it provides some spares). The Nova is a stand alone box that does not require any software on the PC. There's a computer in the Nova box. Some mornings my network connection icon in the system tray shows a yellow triangle and the message that my connection has been lost. This can be fixed by unplugging the power connector on the Nova box for more than 10 seconds and rebooting it. I think this is part of the way the software is upgraded. The front of the Nova has 4 green LED that are normally on and another one that blinks when transmitting. Since there is no software running in the PC, there is not system monitor program in the PC. 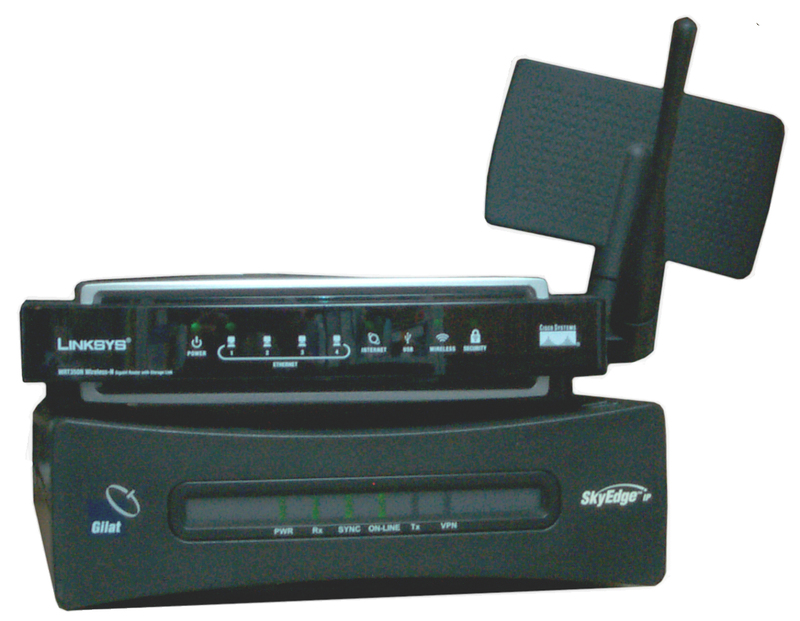 But if you direct your browser to the IP address of your Nova box a web page comes up titled SkyManage. The default Status page has green check marks for various system elements. The Telemetry page shows CPU utilization and Rx signal/noise ratio as bar graphs. On my system the Telephony screen is blank, but I think on the more costly version it supports VOIP and the telephoney page would show something. Unfortunatly you can not access this page when there's a problem like I had this mornig. 5 March 2007 both the Boot and Active Software versions are 2.0.4.1 on the Info page. 27 March 2007 - still getting "Windows can not display web page" error messages that are because of a Nova-StarBand problem, not due to problems at the server. Confirmed that in Win XP Tools\Internet Options\Advnaced\Phising Filter is unchecked. A Router can be added to the Nova system to drive multiple computers. Sometimes the Nova hangs. You can stop the current page transfer and reload and then it usually works. Later today I'll see how it does during the sun blackout time. Recently we had light snow and the Nova system went down. I don't think it was becasue of the snow on the dish, but rather it was that there was snow in the signal path, just like rain in the signal path will stop communications. Pegasus Broadband - coming on line 21 March 2001,maybe will be better than StarBand - now at TigerDirect.com $700 installed + $70/mo. Pegasus, EarthLink and Juno use the DirectPC 2-way systems made by Hughes. "The new system offers return channel speeds up to 128 Kbps, optionally 256 Kpbs, and delivers data at the same speeds as the current product, at rates of up to 400 Kbps." The uplink is 10 times faster than what I now get with StarBand. But that's comparing advertised performance to real performance, who knows what the actual uplink performance is? 7 Oct 2003 - Earthlink has taken over the Pegasus 2-way satellite business. For quite a number of years there have been VSAT (Very Small Aperture Terminals) used for business purposes. For example the credit card readers at gas stations are connected to the credit verification center using VSATS. Gilat has been in this business for some time. The indoor box used for the StarBand 180 is the same unit used for the Skystar and Video Overlay units. It has three slots for the addition of custom features. The StarBand has the left slot for the USB interface. In a normal StarBand install a plate is installed that covers the DIP switches and the LAN port. 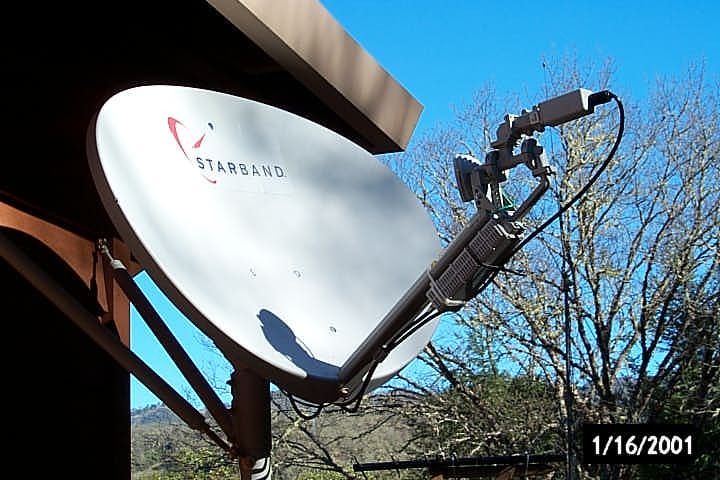 Recently Gilat joined up with Dish Network, Radio Shack and Microsoft to offer a home internet connection service called StarBand using similar (if not the same) technology as used for business VSAT applications. This system was designed for credit card verification like at gas stations were a VSAT antenna is on the roof of the station. It assignes each user a time slot. Military Messaging over HF Radio and Satellite using STANAG 4406 Annex E and other white papers on the isode site. The Starband Uplink is in the South East U.S. and they get severe weather that shuts down the system. This is deceptive because here in California is a nice sunny day. Too bad they located the uplind in such a poor weather location. If you're shopping satellite systems, one of the questions to ask is how many hours of system down time is caused by bad weather? This may not really be the case, I don't know. If you are working on your system and your browser is not configured with a proxy enabled, your computer is naked on the internet. Anyone who knows how can access your hard drive and send you a virus. I think that's how my C: drive became erased. You may need to install a "firewall" package to protect your computer. 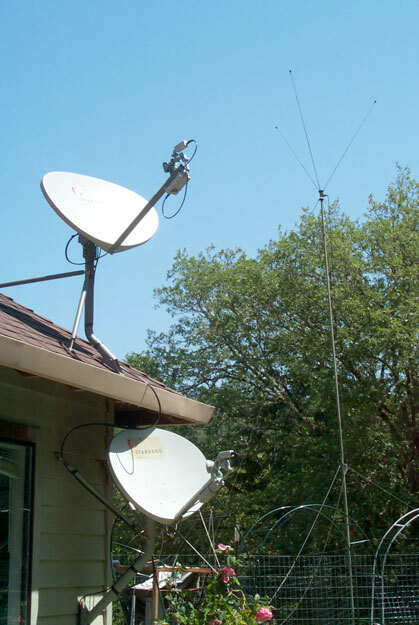 Dish Network will be offering a system with a second LNB mounted to the StarBand dish, this saves having two dishes but really is not otherwise integrated. On their FAQ/homenetworking web page StarBand describes how to connect either the Radio Shack or Model 180 systems to a local LAN, but does not tell how to use the LAN connection on the model 180. Although they claim 500 kbps download (=50 KBytes/sec = 50 KB) and 150 kbps (15 KBytes = 15 KB) upload speeds, I have never seen it. The best for download is about 20 KB and upload about 3 KB. In addition there are long delays between when you ask for a connection and that connection is there. The effect is that you are better off with an internal modem (or better if you have it). I can now connect my modem at 44 K baud (= 4KB) and can do more faster than with the StarBand system. I have only had the system for a week and have called tech support (800 478-2722 #4) almost daily, and they keep saying that they are aware of the problem and working it. I don't know if the system worked before I signed up, or if it never worked. When trying to use FTP to move jpeg files from my computer to my ISP, StarBand is impossible. There are many short data packets and the turnaround time is so long that the FTP program fails to work. In order to get the jpeg image loaded using FTP I needed to disconnect the StarBand USB cable and use my dial up modem. It took less that 10 seconds to make the FTP connection plus the file up load time of another 10 seconds, whereas the StarBand timed out after a minute or two. I have heard that cable modem and xDSL also suffer when trying to use FTP. Mid Dec. 2000 - Box arrived but Starband scheduled and rescheduled the install. 16 Jan. - Once I was able to upload a photo using FTP, but other times I could not. I thought that I was uploading web pages and got a "successful upload" message, but when I tried to view them, the bottoms were cut off. I have disconnected the StarBand, and will try again some time. My phone line modem is much faster for all but very large file downloads. 18 Jan. - They have fixed the Model 180 dropout problem, caused by my NIC being set for auto detect. The fix is to set a fixed IP address of 192.168.0.1 with a sub mask of 255.255.255.0. I am getting download speeds around 577 KB, but the latency is so long that I have disconnected the Model 180 and use my phone line. 26 Feb. - I started to use the system about a week ago. I was getting about 300 K bits/sec (30 K Bytes/sec) downloads and was able to send and receive email. On a few occasions I could use FTP, but not always. Today the system crashed. It came up after about 15 minutes, tech support did not the system was down until I told them. This defiantly should not by your only link to the internet. It needs to be redone so that it can work in parallel with with a wired connection. 28 Feb. I was not able to upload *.TIF graphics files, when trying to view them there would be a message like bad data in line 38. 1 of 6 files would upload. Using the phone line to do the upload was faster and worked 100% on the first try. 1 March - after clicking on a link there was no response, I waited 120 seconds, but still no response, the poor latency problem is as bad as ever! 28 April 2001 - FTP has not worked for some time. Have added Norton Personal Firewall and Norton Antivirus 2001. They work as part of my hard drive backup system that uses Norton Ghost and a removable D: hard drive. Currently I do not use 127.0.0.1, i.e. I have IP Agent turned off. To use the phone connection I just double click my dialer, very simple to do. Note that START\settings\control panel\Internet Options opens the "Internet Properties" dialog box that you can also access through IE. These settings are global on your computer, not just for IE. 3 Jan 2002 - received the 360 upgrade package and sent back the 180. after 4 hours with SB tech support thought that it was working. 4 Jan 2002 - after leaving the system on all night, it was not working in the morning - after 13 hours with SB tech support it was not working! The first problem was that my computer would see the new 360 as a model 180 and so did not connect to the 360. The second problem was that the monitor would turn off (crash) and the only way to bring it back was to reboot. 5 Jan 2002 - after using START\Run\msconfig\startup and unchecking IPA, TaskBarClient and WgWLocalManager and rebooting it works. The 180 uninstall manual on page 8 says Mission Control 2.00.1 patch can be left on your system, but tech support insists it MUST be removed, who is correct? I was told things like "you must use IPA with the 360 it's different from the 180" and "the supplied USB cable is different from a standard USB cable" , are total Bull****! This just confirms the incompetence of the starband tech support system (including a number of "escalation" level support people). When the first level support tech gives you wrong information or has you do wrong things, like accepting an older version rather then keeping the newer version of some software that is already on your system it is almost impossible to recover. I ended up reinstalling WIN98, WIN98SE upgrade, my printer drivers, and there will be more to install as I need it. (IOmega ZIP drive, HP scanner, exter serial ports, etc that were removed because they may have been conflicting. The things that are conflicting are the three programs listed above. The monitor crash problem seems to go away when WgWLocalManager is turned off in START\msconfig\startup, but this slows the download speed from 988 KB/s to 50 KB/s based on http://www.pcpitstop.com download tests. A friend that reads the starband forum told me that the 360 USB driver has a lot of incompatabilities and to use the LAN port instead. In Nortan Peresonal Firewall/options/advanced options\firewall "default block portal of doom trojan" disable 9874 and 9875. When configuring Norton Firewall rules do not use all ports, but instead check the single port shown. 4 Oct. 2003 - system working very poorly and each day gets noticeably worse. Download speed at PC Pit Stop was about 200 kB. Showing the Before case with the Notch Filter installed. Download speed was 452 kB after replacing the LNB and removing the Notch Filter. This shows the new LNB installed without the Notch Filter and the signal reflection angles. You can see that the metal rain gutter is blocking the upper part of the dish. This may no only degrade the signal because of the area blocked, but might also degrade more because of reflections canceling signals. The white material wrapped around the gutter is microwave absorber that stops reflections. Need to relocate the dish. The dish is feed off axis. 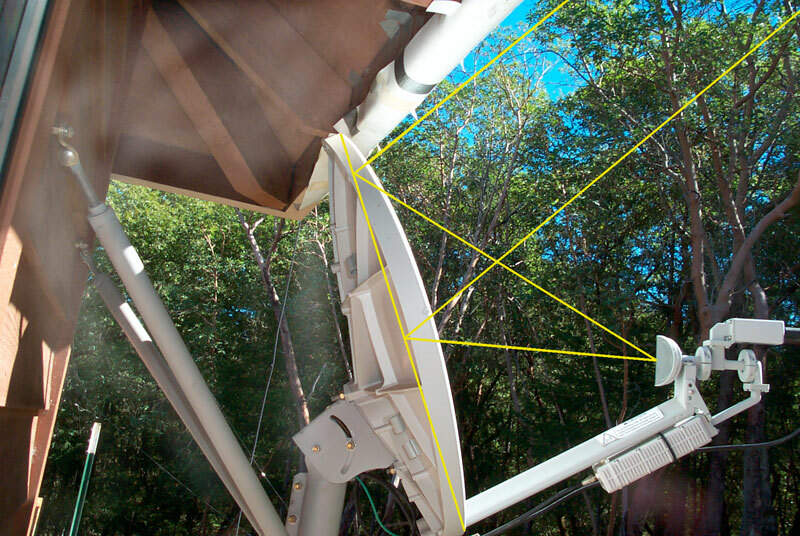 The feed horn is 45 degrees below a line from the center of the dish to the satellite. So the dish points 22.5 degrees lower than the signal path. In my case the dish points in such a way that it clears the rain gutter, BUT the signal is 22.5 degrees higher and so is partially blocked by the metal rain gutter. All geostationary satellites are located over the equator and so twice a year, in the Fall as the Sun crosses the equatorial plane and again in the Spring there will be a time when the Sun is exactly behind the satellite and the microwave noise from the Sun will overpower the feeble signal from the satellite shutting down service. How long this lasts depends on the beam width of the dish which in turn depends on the frequency and the dish size. Starband uses satellites at 101, 125 and 129 degrees Longitude. On 7 Oct. 2003 my StarBand service was blacked out about an hour and a half after I installed the new LNB. It was about 1:30 PDT when I noticed the Mission Control icon was black. Using the calculator at Learfield Engineering and my location. Used Ku and 1 meter dissh diameter. So I looks like I'm on the 129 degree bird. I think that Use the same proxy server for all protocols should be checked. set the address to 127.0.0.1 and Port to 9877 in all the boxes. 27 Feb 2001 - Got an "internal error" separate window when trying to upload from Netscape Composer. make blank the Address and Port for FTP. This fixed the problem. It turns out that the version of IE that gets loaded with Mission Control messes up my computer. In order to continue to work without Starband I needed to uninstall IE (which brought me back to the prior version (and lost all favorites added) of IE). Unfortunately this is something that I can do in autopilot mode. Note: If you are not running IPA then you will need to go back to automatic proxy settings and not use IPA. C:\program files\StarBand\Mission Control\SatStatusServer.exe and TaskBarSvr.exe. You can kill these using <CTRL><ALT><DEL> and highlight them and select End Task. The Browser seems to work fine without them. I have seen the system working with the icon black and the icon green and the system down. This makes it easy to change from phone to Satellite, by changing the proxy assignment. You can try "Release" to break the connection and then "Renew" to re-establish the connection. How to remove the USB card so as to enable the LAN port. The Mod describing how to connect a router to the 180 LAN port to serve a number of computers. Note the router protects your computer from hackers. If you do not use a router and connect your computer directly to the LAN port on the 180 you must run firewall software on the PC. When using the 180 for FTP be sure the Address and Port proxy fields blank. The AS_Agent does a good job of speeding up your browser by omiting the link to determine the DNS of your target, letting the computer at StarBand headquarters do this. You do not want to do this when using FTP. 28 July 2001 - Today is the first time that I was able to uplink using File Transfer Protocol. I used WS-FTP LE (freeware) made by Ipswitch. Ping is when you sent a small packet to some IP address and they send it back to you. The round trip time is measured. Search on "PING" and you will find many web sites that will ping you, East Coast, West Coast, Europe, etc. The theoretical ping time up to and down from a satellite is about 1/2 second. I am getting 0.8 to 1.8 seconds. But there must be something else wrong because sometimes I wait miutes for a page to load. This web site has "Tweak" and I added the DefaultRcvWindow registry entry at 65535 and tried to turn on MTU using DrTCP, but it did not seem to make a lot of difference. Because there is a transmitter involved in the uplink the dish setup needs to be much more accurate than for a normal Satellite TV receive only system. In particular the rotation (polarization) of the transmitter feed is very critical so as to not be transmitting in the opposite polarization "cross pol". This also means that a qualified installer must set up the system. It also means that you will not see these systems on platforms that can move for some time to come. If the Mission Control software does nothing, then why should 180 users upgrade. On the StarBand web page they requested that all 180 users leave their boxes powered up for a week in Feb. 2001 so that StarBand could download new firmware into the 180 boxes. I think this is where the improvement comes from, not the Mission Control Software.